Project progress has slowed down lately. Probably due to the hot weather and the flies making it unpleasant to be outside. Instead we've been spending our time thinking and planning. We have many of our ideas scribbled down on a printed out Google map of the property, and it gets added to all the time. Sometimes I pull the map out and realise that we had the placement of something we've been wondering about already on the map! Oops, forgot about that. When we started thinking about the shed project again - the half finished one that's stalled - it became obvious that we've squeezed ourselves into a confined area and it's just not going to work. The shed project has stalled because we're not feeling sure about the design or the location. It's an uncomfortable feeling that's just not going away! So, pulling out the map of the property, there really is only one spot near the house that hasn't been ear-marked for other great things.. the North side of the house. The North is a tricky location, but after pondering it for some time, we've seen that it would make a perfect location for the shed of our dreams. There's enough room to fit the cars, tractor, implements, materials storage and even the workshop all in that one location. Not only that, but the roof would have enough room (and is facing the correct direction) for a proper solar array. There is no more room on the cottage's roof for any more panels, and it means we can plant deciduous trees around the house to benefit from their shade. We could even put the solar command centre and batteries in there. So, location sorted, design almost perfected, we're waiting on our friend and neighbour to dig out the pad nice and level. I think Marty is going to order the materials tomorrow. We're both feeling energised by the new design and location - which has to be a good sign. Yes, I have a good feeling about this! The other plan I've been thinking about is the kitchen. I needed to figure out the rough layout of the room so we can have 240V power installed to the correct location. I used Sweet home 3D and a tape measure and given all the constraints, it was easy to fit the the pieces of the puzzle together. That's the rough plan for now. 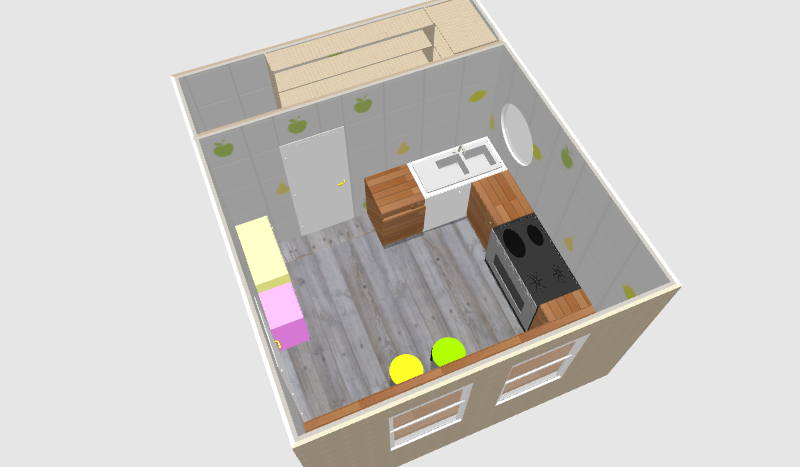 It's difficult to show it properly without being able to move it around, but the idea is that we'll wall off part of the kitchen to create a big cold cupboard/pantry that also houses a little chest freezer. The cold pantry will be full of shelves for storage of food etc. The rest of the kitchen had to go where it will fit. The oven is a representation rather than a real thing.. the sink will hopefully be a corner sink, and the yellow and pink represent cupboards we already own and didn't want to get rid of. We'll put any 240V appliances on them in that corner. We've always wanted to cut a window into the North wall.. and no, the walls won't look like that at all! Ha! But you get the idea..? So, other than planning, our time has been taken up with gardening, mowing, working and going into town.